Sen. Manny Pacquiao, during Monday night’s episode of “Bawal ang Pasaway kay Mareng Winnie”, said that there was nothing wrong with burying the former President and dictator Ferdinand Marcos in the Libingan Ng Mga Bayani because no one but God was in a position to pass judgment on the late strongman. 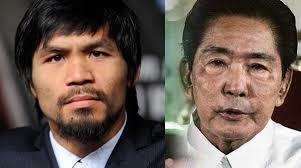 Pacquiao also suggested that Martial Law and torture victims should just simply forgive the late dictator. “Mga nagawa niya (Marcos), dapat patawarin na lang sila,” the senator stated. He also believed that Marcos’ dictatorship and eventual ouster did not disqualify him from interment at the LNMB. Rather, Pacquiao argued, Marcos became dictator only after he became president, and being elected president qualified him for the LNMB. “Ganito kasi yun, eh. Na una ba ang pagiging diktador niya bago naging presidente, o na una yung presidente bago naging diktador? Pagka presidente niya, qualified na to be buried,” Pacquiao explained. The boxing champion also said that with Marcos’ burial in the LNMB, the issues surrounding his dictatorship, plunder, human rights violations would be buried along with him. “Ganito po kasi yun, eh. Matagal na po iyang issue na yan. Hanggat hindi nailibing yan, ang issue buhay na buhay. Hangat hindi nalilibing yan hindi mawawala ang issue. Pag nalibing na yan, hindi na mapagusapan niyan,” Pacquiao pointed out. Critics responded angrily to the surprise burial of Ferdinand Marcos at the LNMB, with a spontaneous protest held at the People Power Monument along EDSA. Another, thousands-strong “Black Friday” protest was also held at the Luneta on November 25, with another such demonstration scheduled for November 30.